You all know by now how much I absolutely love menu planning. Not because it’s necessarily something I love doing every Sunday night but because I know if I don’t my week will be a disaster. Menu planning has been and continues to be an absolute life game changer for me. No joke. I don’t say that lightly either. You don’t do something every week for 12 years straight if it doesn’t bring you HUGE benefits in return. And the benefits of menu planning are plenty. I save money (so much money! ), I eat healthier, I save my sanity (and avoid the witching hour!) as well as save so much time in the kitchen. This last one is high up there on my list. I don’t love to cook so my goal is to plan meals that allow me to get in and out of the kitchen fast while still eating healthy, delicious food. Menu planning works, there is no question about that. I’ve been sharing this passion of mine and my weekly menu here on the blog every Monday for the past 12 years. I love to help make life easier for others and menu planning will definitely make your life easier. However, it is a chore like any other and I understand that sometimes it can fall by the way side when life gets busy. That’s when you try and wing it and things really go awry. You end up eating out more and spending more as a result. Food in the fridge gets wasted, your stress levels go up and pounds often pack on from eating too much pre-packaged convenience foods. But don’t you worry. 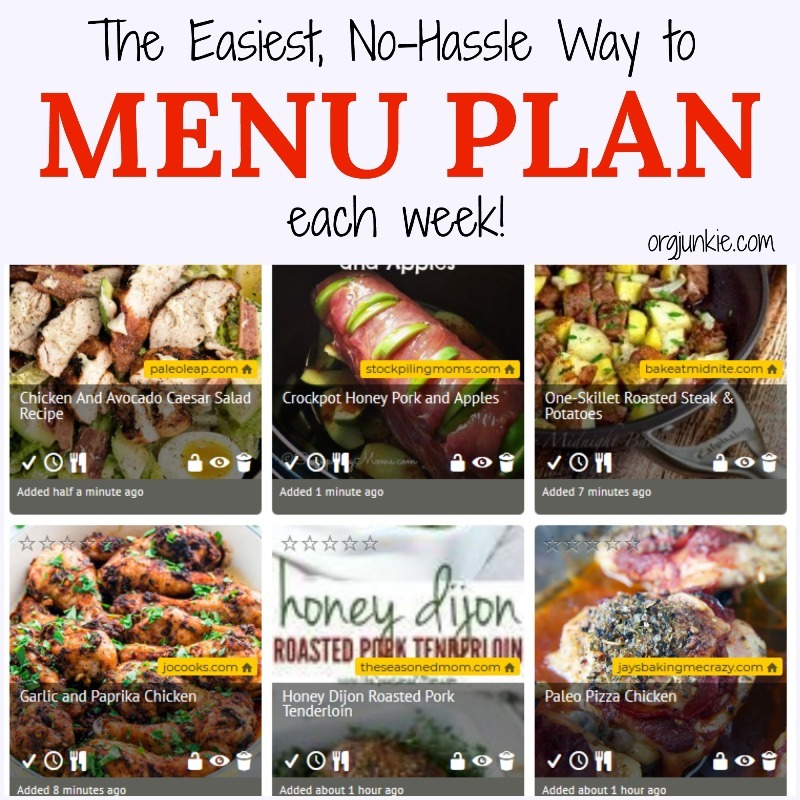 There is a way to make menu planning not only FUN but FAST as well. I mention this service on every Menu Plan Monday post and many of you already use and love it. 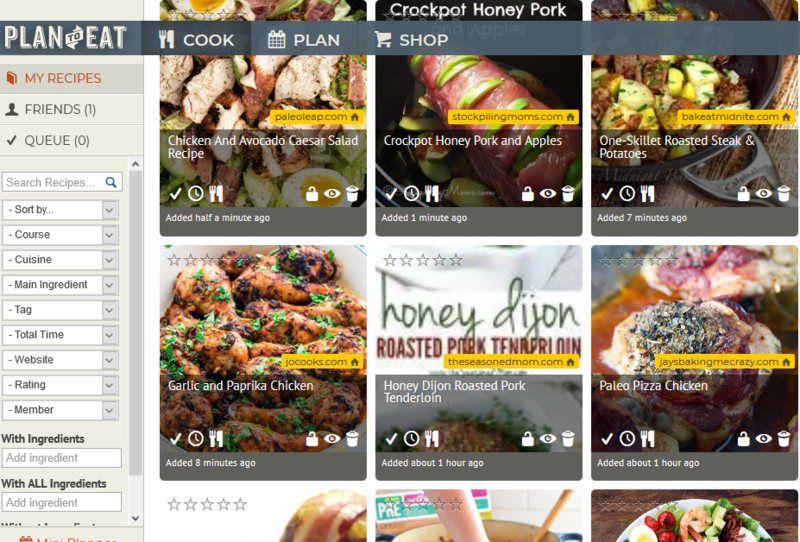 The company is called Plan to Eat and it is a recipe management and menu planning tool all in one. It’s super easy to use (there ain’t nobody pickier than me!) and you can have your menu planning AND shopping list generated in 5 minutes or less. Say what? Yep, it’s that brilliant. They offer a free trial that you can sign up for now if you want to test it out. It’s such a simple tool to use. Let me show you. Across the top of the page you have three simple options to choose from: cook, plan and shop. Under COOK is where you keep your recipes. You can manually add them if you want but the easiest way to do it is by importing them from the web. This feature is my favorite because it saves so much time. 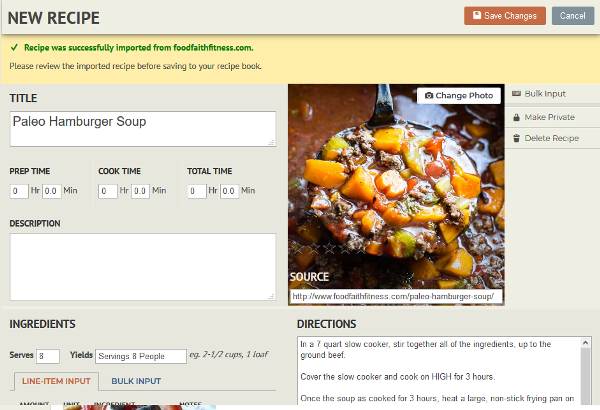 Since I love using recipes from around the web all I have to do is just copy and paste the link in. Plan to Eat then imports the entire recipe including ingredients, directions and a picture into your Plan to Eat recipe directory. Once you have recipes imported they are there for you to use for all future menu plans. Recipes can be categorized by course, cuisine and main ingredient which makes it really easy for you to search for particular recipes. I added Paleo under cuisine so I could easily find all my Paleo recipes. Next click on PLAN and simply drag and drop (yep that easy!) your recipes from the list on the left to the week and date you are planning for. There is space to plan for breakfast, lunch, dinner and snacks if you want to. Another nice feature is that you can choose to start your weekly menu on any day of the week. It’s totally up to you, yay! 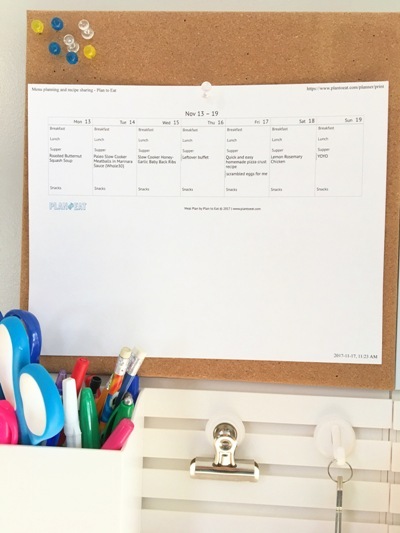 I also love that you can print your menu plan out and put it on the fridge or bulletin board for your family to see so they stop asking every two seconds know what’s coming up. Now you are ready to SHOP. 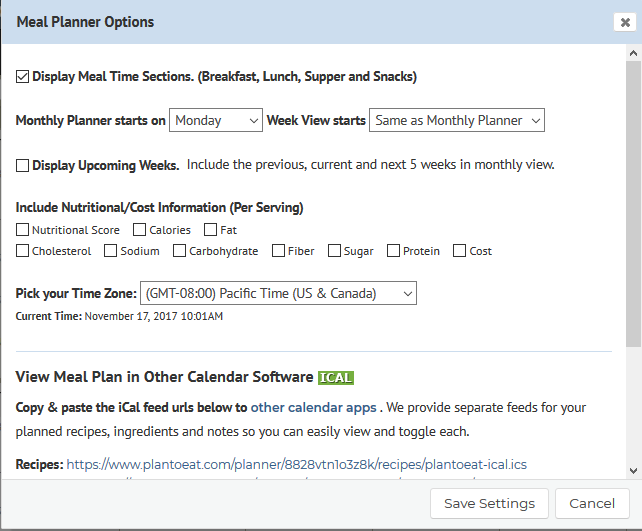 Select the dates of your menu plan that you want to shop for and Plan to Eat automatically generates a shopping list for you. A letter goes beside every ingredient so you can easily see which recipe it belongs to. Easily add or delete ingredients as needed depending on what you might already have on hand. Those that have the Plan to Eat service can also use the free app if you’d prefer the convenience of planning your menus on the go rather than from your desktop. It works really well! It’s that easy! Plan one week at a time or an entire month if you want to. 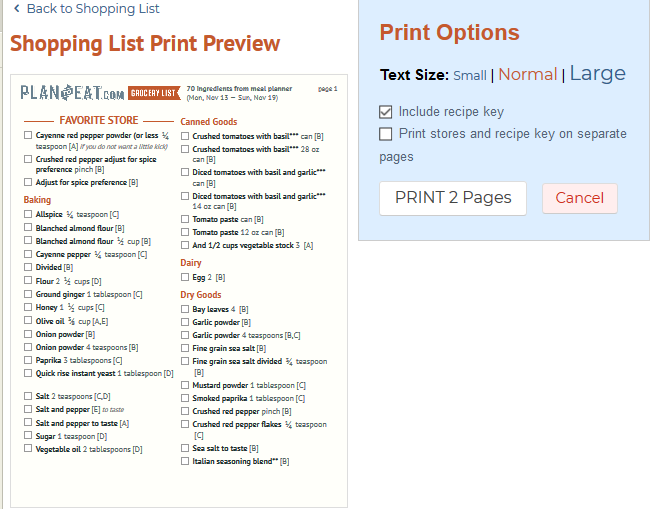 Just drag and drop your recipes in the calendar and print off the shopping list. Done and done. I can’t recommend it more highly!! Go ahead and sign up for your free trial right now. Please let me know if you have any questions about Plan to Eat. I’d be happy to try and answer them for you.